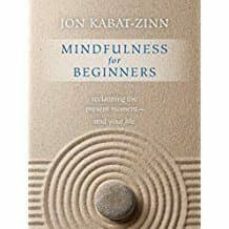 We may long for wholeness, suggests Jon Kabat-Zinn, but the truth is that it is already here and already ours. The practice of mindfulness holds the possibility of not just a fleeting sense of contentment, but a true embracing of a deeper unity that envelops and permeates our lives. With Mindfulness for Beginners you are invited to learn how to transform your relationship to the way you think, feel, love, work, and play--and thereby awaken to and embody more completely who you really are. Here, the teacher, scientist, and clinician who first demonstrated the benefits of mindfulness within mainstream Western medicine offers a book that you can use in three unique ways: as a collection of reflections and practices to be opened and explored at random; as an illuminating and engaging start-to-finish read; or as an unfolding "lesson-a-day" primer on mindfulness practice.